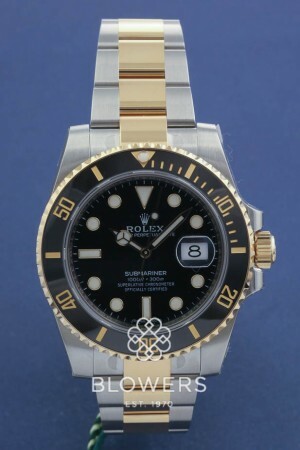 Rolex Bi-Metal Submariner Date 116613LN. 40mm case diameter with black maxi dial and black uni-directional ceramic bezel. The watch is water resistant to 300 meters and features a calibre 3135, self-winding mechanical movement entirely developed and manufactured by Rolex. Bi-Metal Oyster lock bracelet with comfort adjust. Pre-owned Unused, Rolex seals still in place. Box and papers dated June 2018. SKU: 30-88-072. Categories: Gents, Rolex, Submariner.